Ravelry :: This site if you're not already a member is available through registering and you'll then be sent an invite. You can populate a home page for yourself (or not) take part in forums, find local groups, search thousands of patterns for crochet and knitting - many of which are free or low cost to download, search for projects people have used the yarn you have in your stash, find new local independent yarn suppliers, place your excess stash up for sale or swap, pop along to a local ravelry event and meet your cyber buddies, read their monthly E-zine, visit the troubleshooting pages, share your own patterns and designs, potentially become a designer and sell your own patterns through their pages - if you join in the fun, come and find me 'Clobell'. LYS :: I don't know which yours will be but I haven't come across a Local Yarn Store that doesn't offer at least incredibly knowledgeable and dedicated staff truly engaged in their crafts and at most lessons/courses, Knit and Natters and lovely discounts to help you build your stash. You Tube :: I'm sure you'll have come across it before but youtube is more than a place to find comedy videos and repeats of X Factor auditions. If you search for a technique you may be stuck on- highly likely you'll find someone's video that could bring it all to life for you (I had this epiphany with Norwegian Knitting as I couldn't grasp the continental way to purl - videos for all those terms if they're unfamiliar can be found here too). Pinterest ::Once you start looking and re-pinning and increasing your boards with inspirational items it will be very hard to tear yourself away! Read my post from here for a teeny bit more. Or click on the button in my side bar to follow me (at very beginning stages so far!). Knitting Pattern Central :: Website offering lots of links to free patterns and also has a section dedicated to knitting and crochet combos. Knitting Help :: A fab resource of videos of different techniques, forums and the ever useful glossary - including lots of what you need from the CO to the BO! Knitting - a great gallery of the patterns in the magazine - less toys and novelties but you will come across home items, I also find they have more patterns aimed at intermediate levels so good when you want a stretch. Each month you tend to find a theme to the magazine and I feel the patterns have a more traditional style to them. Also home to the lovely Purl Princess of Purl About Town column. Knitting also has a great LYS (Local Yarn Store) search function and it surprised me when it found 2 close to me I hadn't even heard of. Jane Brocket :: blog writer, author of gorgeous books - if you're like me you'll fall in love with the whole blog but Jane has a lovely section dedicated to yarns and knitting too. Attic24 :: A lovely homey blog with inspirational bright colours, cheery commentary from a Mum of 3 who crochets up a storm. Below is my 'Granny Stripe' still on the hook at the mo. The blog has loads of step by step, picture based tutorials and so far I've made the ripple, snowflake, some hearts and WIP my stripe. Lucy has a Ravelry group dedicated to her called 'We Love Lucy', where you can find moral support, banter and lots of links to pics of peoples finished articles. CocoRose :: A beautifully styled blog with a variety of lovely things to look at, great text and crochet inspiration. If you love muted shades, this site is gorgeous and filled with shabby chic imagery to keep you motivated. About.com :: When I first started to look for crochet resources and wasn't a member of Ravelry at the time, I came across about.com and it helped give me loads of pointers and basic patterns - just be cautious as you'll find both american and british terminology in use. The chocolates look amazing!! A few places I had not stumbled across yet - I really must try pintrest but fear it may take up all my free time! Thanks for some great links, they'll come in very handy. I am determined to master crochet this year, after a couple of failed attempts last year. I already know of Lucy at Attic 24 and linked to her on my blog today. 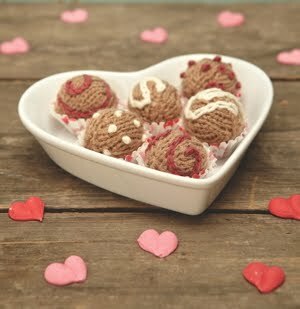 Her teeny crochet hearts fitted in perfectly with my Friday Faves theme.